Left: The high school student on the left of the Environmental Club photo (yesterday’s blog post) asked me to take her picture with two other students (right photo) because they were doing a community service project with the Plymouth Christian Youth Center in North Minneapolis. If anyone knows any of these students, point them here and hopefully they’ll attach some comments with details on the project. 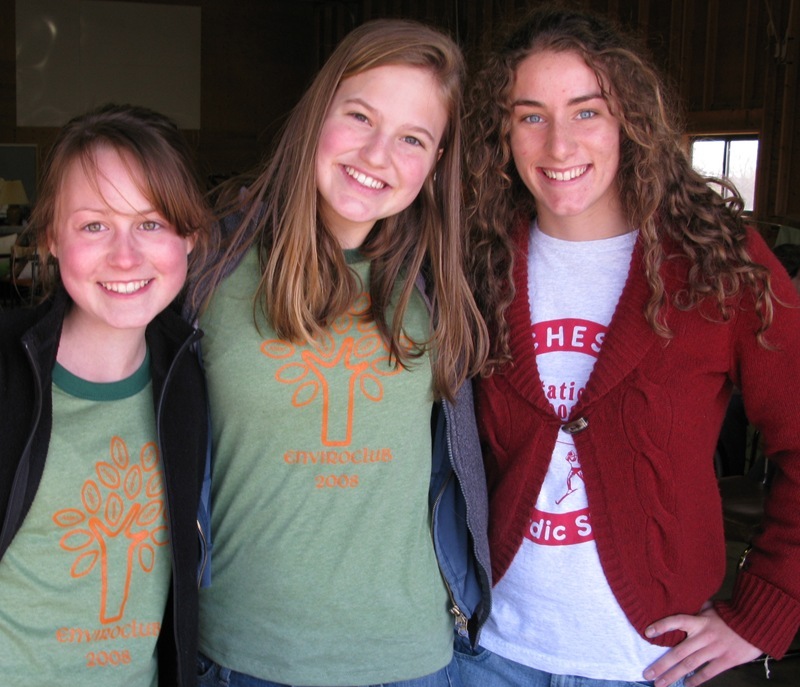 My name is Caitlin Ruppel and I am the student on the left in the NHS environmental club picture. I am a junior at NHS and in the Service Learning class led by Sarah Swan-McDonald. 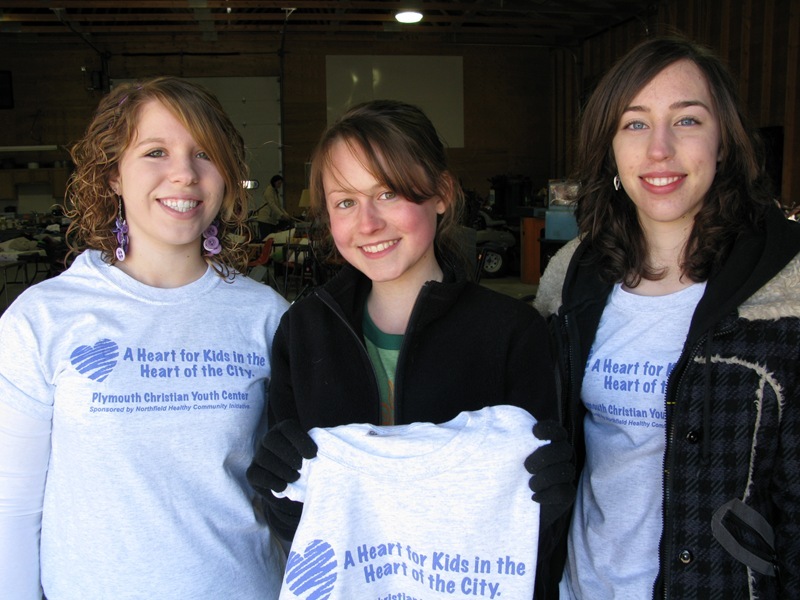 Yesterday Heather Ludwig (left in Service Learning photo), Christine Nead (right in S.L photo), and I were selling t-shirts with the slogan, “A Heart for Kids in the Heart of the City” for ten dollars at the Goods for Good sale. The money will go to the Plymouth Christian Youth Center in Plymouth, Minneapolis. This is a center which is working to get youth off the streets and provides an alternative high school for students in grades 9-12 as well as after school programs for elementary aged kids. The non-profit organization offers a theater program in the summer and about 45 youth participate. However, not all youth have the necessary finances to participate and the organization is looking for donations to cover these costs as well as costs of artists coming to teach and necessary renovations for the building. The proceeds from our t-shirt sale will go towards helping the PCYC accomplish its’ goals. There are still t-shirts left which we hope to sell at the high school and around Northfield; donations are also accepted. We also have brochures about the organization if anyone wishes to have one. In the next couple weeks we hope to hold a book drive as well. For further information please feel free to contact me at caitlinruppel@gmail.com, thank you for the support! Thanks for the update, Caitlin. Kudos to you, Heather and Christine for the project. I’ll take a t-shirt. Just bring it to my ‘corner office’ at GBM most any morning, 6-9 am. And be sure to add a comment here when you have the details on the upcoming book drive. Thanks, we will stop by with a shirt next week. As for the book drive, it is in conjunction with the one going on at the high school for the “Book Nook”. We are looking specifically for books which are for kids in grades k-6. There are collection boxes at several businesses around town as well as at the high school. Books will be collected until Friday May 23, 2008.